Opportunistic pathogens, as defined by Nester et al. (2004), are pathogens which infect people with underlying medical conditions which ultimately lead to compromise of the immune system. These organisms cause what are collectively known as opportunistic infections, common among patients with AIDS, those undergoing therapies, post-surgery patients and drugs abusers. These infections sometimes interweave with nosocomial infections. A lot of microorganisms can cause opportunistic infections, even those known to be generally less virulent. Most normal microbiota would inadventently cause some kinds of infection when there is a hole in the wall of the immune system as stated in this article. However, there are some microorganisms which have over the years been known to be common causative agents of opportunistic infections. They include, among others, Candida albicans, Clostridium difficile, Cryptococcus neoformans, Pseudomonas aeruginosa, Staphylococcus aureus, Streptococcus pneumoniae, Streptococcus pyogenes and Toxoplasma gondii. Among all these, P. aeruginosa has over the years become the most prominent causal of opportunistic infections. Pseudomonas aeruginosa is a Gram-negative, rod-shaped bacterium that belongs to the ?-proteobacteria. This clinically challenging, opportunistic pathogen occupies a wide range of niches from an almost ubiquitous environmental presence to causing infections in a wide range of animals and plants. It can be found in the soil, water bodies and many other natural and artificial environments. Its ability to utilize a wide range of organic substances as food sources has also made the organism ubiquitous, perhaps second only to Escherichia coli. It has been found to be the leading cause of hospital-acquired infections (nosocomial infections) due to its ability to inhabit any surface. Recent studies which have also shown that it has the ability to degrade hydrocarbon and be used as an oil-spill degrader, coupled with its ability to survive at extremely low oxygen level (even in its absense), and alter its properties in response to changes in the environment, has made the organism one of the most interesting in microbiology and at the same time one of the most dreaded in clinical environments. The survival of the organism as a pathogenic and opportunistic organism has been attributed to its numerous characteristics which makes it a hardy microbe. These includes: its very simple nutritional requirement (it can grow in distilled water); its metabolic versatility (it can utilize over 75 different organic compounds for growth); its ability to survive high temperature (up to 500C); its ability to thrive in moist and dry surfaces; and its resistance to adverse conditions, high concentrations of salts, and many antibiotics. Perhaps, its resistance to numerous antibiotics has recently double the threat of the microbe to the medical world. Now, there is what is known as Multidrug-Resistant Pseudomonas aeruginosa (MDRPA), a hyper-mutated version of the bacterium which is resitant to more than ten well-known antibiotics. Acccording to P. A. Lambert, an author who labelled the bacterium as “a notoriously dif?cult organism to control with antibiotics or disinfectants” in his study, Mechanisms of antibiotic resistance in Pseudomonas aeruginosa, its general resistance is due to a combination of factors which include: its intrinsically resistance to antimicrobial agents due to low permeability of its cell wall; its genetic capacity to express a wide repertoire of resistance mechanisms; its resistance through mutation in chromosomal genes which regulate resistance genes; and its ability to acquire additional resistance genes from other organisms via plasmids, transposons and bacteriophages. According to Todar’s Online Textbook of Bacteriology, P. aeruginosa is found on the skin of some healthy persons and has been isolated from the throat (5 percent) and stool (3 percent) of nonhospitalized patients. Within the hospital, disinfectants, respiratory equipment, food, sinks, taps, toilets, showers and mops are the main formites that serve as reservoir of the organism. Spread can also be enhanced by visitors, patient to patient on the hands of hospital personnel, direct patient contact with contaminated reservoirs, and by the ingestion of contaminated foods and water. 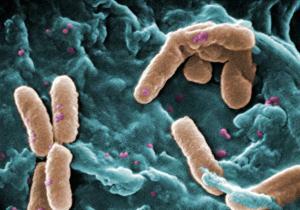 According to this author, the spread of P. aeruginosa can best be controlled by observing proper isolation procedures, aseptic technique, and careful cleaning and monitoring of respirators, catheters, and other instruments. Topical therapy of burn wounds with antibacterial agents such as silver sulfadiazine, coupled with surgical debridement, dramatically reduces the incidence of P. aeruginosa sepsis in burn patients. In coming weeks, more topics will be discussed on this unique microbe and its ability to really cause untold hardship, both on the medical/scientific world and the patient/layman world.